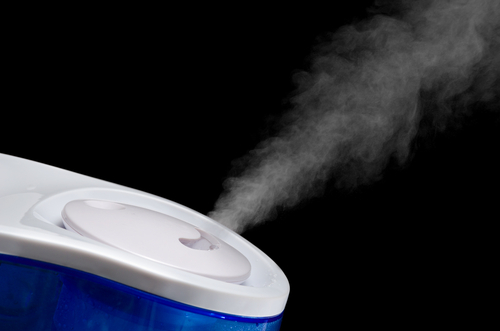 One of the primary ways a whole-house humidifier saves money is by making the air feel warmer. Dry air has a tendency to remove moisture from your skin, thereby cooling you down. During the winter months, the humidity in the air inside of your home will make you feel a small bit warmer, and you may be less inclined to raise the temperature setting on the thermostat, possibly reducing utility costs. A healthy and comfortable home should have a humidity level between 35 and 50 percent. When the humidity level is in that range, homeowners find that family members experience fewer problems with dry nasal passages, throats and skin. A humidifier can help maintain good health during flu season, because dry air breeds viruses that cause cold and flu symptoms often experienced in the fall, when we turn on the home heating system. Keeping a balanced level of moisture in the house is a preventative measure against winter illness. Maintaining an appropriate humidity level within the home is good for you, and it's good for your home and furnishings, too. Low humidity levels may cause wall coverings to peel, or wood furniture and flooring to crack or split. If your home feels excessively dry, or you are experiencing these specific types of personal discomfort, check the humidity level. If it's not between 35 and 50 percent humidity, contact us at Hartman Brothers Heating & Air Conditioning to hear more about how a whole-house humidifier can save money and improve your comfort during the winter. Our goal is to help educate our customers in New Haven, Indiana and surrounding Fort Wayne area about energy and home comfort issues (specific to HVAC systems). For more information about humidifiers and other HVAC topics, download our free Home Comfort Resource guide.